And once again the markets are happily and excitedly awaiting more free zombie capital from a major central bank, this time the ECB. Of course this is capital the markets, judging from where stock exchanges find themselves, absolutely don’t need, but, you know, gift horses have foul breath and all that. I never see anyone talk about this, but the biggest reason why all banks should be fully restructured, all assets and liabilities, is not even, though it’s certainly true, that they are too big, that they have too much debt, or that they prey upon society, but it’s that restructuring bank debt will chase zombie money away all across the financial markets. That is long overdue. All those QEs lead to humongous and growing distortions of the economy you and I have to live in. And since we have no access to the funny money, but it does get used to buy real assets, like land, food, water, at insanely bloated prices, it is hugely destructive to the world we need to survive in, to our future ability to survive. Whoever bought into these basic human needs at highly inflated “values” will be looking for a “healthy” return long after you and I will no longer be able to afford them. This will lead to severe human suffering, and only because we, as a society, refuse to be honest. It’s not just some vaguely defined elite, it’s you too. You too are hoping for recovery, now, with your wealth intact. And it’s the Chinese who’ve managed to get hold of part of the $7 trillion or so Beijing stimulus, and that’s before it was leveraged (a scary thought indeed! ), and use it to buy US land. It’s all zombies all the way down. And there’s no way that’s not going to crash. As long as banks don’t have to fess up to their losses, lots of other parties don’t have to either. That’s why there are so many people and institutions who label themselves “investors”, and often even borrow to buy stocks, who are just as much zombies as the banks are. Their “capital” would be wiped out faster than an HFT flash if we would start being honest about what things are worth. But our governments and central banks have decided that we’re going to lie to ourselves up to some undetermined point in the future, when our economies are supposed to reach escape velocity, when, to put it in other words, our lies will become the truth. The past 6+ years of attempts not to come clean are tremendously damaging to society at large because they for instance keep the hopes alive for recovery and growth, notwithstanding the fact that the whole charade facade is based on the refusal to let actual and honest markets determine what assets are worth. And how much more obvious does it have to get that you can and will never ever restore faith and confidence in markets as long as you keep distorting them with these neverending interventions aimed at, well, distorting them even more? We lie to ourselves, as a society and as individuals, on a constant basis because we (have been led to) believe that we have no choice but to forever chase an illusive entity named economic growth that we don’t even need at all. We’re rich enough. More than rich enough. The growth illusion is more destructive than anything in the history of the planet. And we know it, we – can – see it every day in the world around us. And we know, too, that we don’t need any more growth. What do any of us lack in a material sense? We also know that nothing can grow forever, and the cancerous tumor metaphor is as obvious as it is well-known. But if you can find one single politician or analyst where ever you live who doesn’t want more growth, please let me know. A smart species? Us? I don’t see how, if we were, we could find ourselves where we do. We destroy the only reality we have, this planet, to chase illusions we don’t even have a real use for. I think I’ve said this before: the only thing that makes us different from amoeba, when provided a surplus of energy, is that we can watch ourselves use it to destroy the very things need to live. And be aware of it. So much for awareness. And for being smart. If we really were smart, we’d stop this madness, starting with the bank bailouts and the voting for whoever promises the rosiest gardens and the biggest profits. There must be a better reason for us to have been put on this earth than to chase profits and eternal growth and faster cars and bigger TV screens and one mile high buildings and even deadlier weapons to kill one another with. Because if there’s not, or even just if we can’t find that reason, we should say goodbye and leave this humble abode for the incredible beauty around us to survive in. The much-awaited Non-Farms Payroll Report didn’t produce any positive result for bulls. The report on Friday showed 192,000 jobs vs. 206,000 expected and the prior report was revised higher to 197,000 from 175,000. The unemployment rate remained at 6.7% vs 6.6% expected. Inside the numbers though conditions weren’t that rosy. In fact, looking at Janet Yellen’s “dashboard,” many data points weren’t positive including: declines in wages from 0.4% to 0.0%; only 1,000 new manufacturing jobs created; temporary Help came in at 29,000; retail was just 21,000 and leisure and travel was a mere 29,000 — not to mention that in combo these jobs are dominated by low-wage paying part-time work. Plus, underemployment, the labor participation rate and the long-term unemployed numbers are still bothersome. Overall the report is dovish for the Fed, as these data points were so weak the Fed is less likely to raise interest rates any time soon. So, why the market decline? Bulls are too complacent and too many sectors were overstretched. Social Media and Biotech are two sectors exemplifying this condition. These sub-sectors in turn spilled losses over to larger parts of the market, notably the NASDAQ 100 (down 2.33%) and other major markets like small-caps. However, overseas markets for the most part were able to avoid much of the selling. For much of the past year, Tesla Motors seemingly could do no wrong in investors’ eyes. An early unbroken string of quarterly losses, ambitions to build a huge battery factory: no matter. Shareholders kept pushing the company’s stock up, by about 50% this year. But on Friday, the market had second thoughts about its onetime darling, as Tesla shares tumbled nearly 6%. That sudden turnaround played out again and again in the once-high flying technology and biotechnology stocks that propelled the markets for over a year. The Icarian Tumble of beloved names, like NXP Semiconductor and the biopharmaceutical company Alexion, signals a potential shift in investors’ belief in chasing eye-popping growth. What remains to be seen is whether the damage has been contained, or even if these stocks have finally hit earth. All that is apparent now is that many “momentum” stocks, those that had drawn buyers because of their ascending trajectories, ran out of steam on Friday. While the three major market indexes were down that day, the Nasdaq composite index fell by more than double the descent of the Standard & Poor’s 500-stock index or the Dow Jones industrial average. The Nasdaq began to wobble a little before 11 a.m., and then commenced a full-on tumble, ending the day down 2.6% at 4,127.73. Behind the index’s plunge was its very nature as the home of many of the highest highfliers, whose valuations have soared to spectacular levels. Over all, the Nasdaq trades at 31 times the reported earnings of its constituent companies, or nearly twice the ratio seen with the S.&P. 500. “There is concern that we could be at a near-term market peak,” said Dane Leone, the head of United States market strategy for Macquarie. If that is true, he added, investors rightly worried about holding onto stocks that were correlated so closely with overall market performance. When Mario Draghi flies to the U.S. this week, he will leave a 1 trillion-euro ($1.4 trillion) question mark hanging over Europe. While the European Central Bank president can show his new quantitative-easing plan to officials at the International Monetary Fund meetings in Washington, he has yet to reveal his full hand to investors on its design. That suspense risks setting them up for disappointment, according to economists at UniCredit SpA and Deutsche Bank AG. The global economy seemed to be on the mend when the International Monetary Fund met for its spring meeting in Washington 10 years ago. Alan Greenspan had cut official interest rates in the US to 1% after the collapse of the dotcom boom and the world’s biggest economy had responded to the treatment. Gordon Brown was chancellor of the exchequer and the UK was in its 12th year of uninterrupted growth. Companies in the west were flocking to China now that it was part of the World Trade Organisation. The talk was of offshoring, just-in-time global supply chains and integrated capital markets. The expectation was that the good times would last for ever. No serious thought was given to the notion that total system failure was just around the corner. Faith in the self-correcting properties of open markets was absolute. When the crash duly came, a self-flagellating IMF confessed that it had been guilty of groupthink. It had either ignored the signs of trouble or played down their significance when it did spot them. The fund has learned some hard lessons from this experience. Downside risks to the forecasts in its half-yearly World Economic Outlook (WEO) are now exhaustively catalogued. The world of 2014 is not dissimilar to that of 2004. The boost provided by cheap money has got the global economy moving. Inflation as measured by the cost of goods and services is low but asset prices are starting to hum. Financial markets have got their mojo back. Deals are being done, big bonuses paid. The received wisdom is that the worst is over and that the prospects for the global economy will strengthen as the remaining problems are ironed out. Come on, everybody, you’re not borrowing enough! In the twelve months to January, the lending of U.S. banks to households increased about 3% while, over that period, their loanable funds (excess reserves) soared by an incredible 59.4%. Clearly, massive monthly asset purchases by the U.S. Federal Reserve (Fed) were of no great help. The banks’ near retreat from their core business (consumer financing), along with sluggish income growth and a large slack in labor markets, weakened all the key pillars of private consumption. Is it any wonder, then, that the inflation adjusted consumer spending – 70% of the U.S. economy – was growing at a rate of 2.2% in the first two months of this year, after a lackluster 1.9% growth during 2013? The void left by the weak bank lending to consumers has been filled by nonbank financial institutions (finance companies, credit unions, etc.). Lending to households by these companies rose a whopping 9% in the year to January, and was 47% higher than the amount of consumer loans booked by commercial banks. Hence an interesting question of monetary policy: Why do banks prefer to keep their huge excess reserves ($2.5 trillion at the last count) at the Fed at an interest rate of 0.25% instead of making car loans at 4.4% or two-year personal loans at 10.2%? I can take a guess at some answers, but that is irrelevant. The important public policy issue here is what the Fed makes of all this, and how it intends to solve this well-known problem plaguing the U.S. economy over the last few years. Monthly asset purchases – on top of a virtually zero% interest rate – have been a relatively easy part of a sweeping crisis management. The verdict on that policy is given by America’s demand, output and employment. It is perhaps time to adjust policy instruments and intermediation techniques to address some apparently structural issues whose solution does not seem to be in the wall of money thrown at the U.S. economy. I have no doubt that the Fed’s highly capable technical staff is fully aware of these problems, and that – given a chance – they could probably come up with specific remedies instead of continuing with an excessive monetary creation. One of the first investors in Pimco’s $232 billion Total Return fund has begun looking for an alternative fixed income manager as concerns over the world’s biggest bond house escalate. The Orange County Employees Retirement System, situated just 12 miles from Pimco’s headquarters in California, has instructed an investment consultant to search for an “additional” domestic fixed income portfolio manager. The $11.5 billion pension scheme has invested in Pimco chief executive Bill Gross’s Total Return strategy since 1982, but it has put the fund on watch due to “organisational and personnel issues” at the company. The setback follows the resignation of chief executive Mohamed El-Erian in January, which triggered widespread criticism from investors and analysts about Pimco’s recent investment performance and Mr Gross’s management style. The Californian pension fund has $1.3 billion invested in Pimco and $582 million in the Total Return fund, which has suffered $52 billion of outflows in the past 11 months. Pimco declined to comment on Ocer’s decision but a spokesperson said the bond house has seen “considerable interest from institutional and retail investors in fixed income strategies” beyond its core bond funds. Since 2008, the number of people who call themselves middle class has fallen by nearly a fifth, according to a survey in January by the Pew Research Center, from 53% to 44%. Some 40% now identify as either lower-middle or lower class, compared with just 25% in February 2008. According to Gallup, the percentage of Americans who say they’re middle or upper-middle class fell eight points between 2008 and 2012, to 55%. And the most recent National Opinion Research Center’s General Social Survey found that the vast proportion of Americans who call themselves middle or working class, though still high at 88%, is the lowest in the survey’s 40-year history. It’s fallen four percentage points since the recession began in 2007. The trend reflects a widening gap between the richest Americans and everyone else, one that’s emerged gradually over decades and accelerated with the Great Recession. The difference between the income earned by the wealthiest 5% of Americans and by a median-income household has risen 24% in 30 years, according to the Census Bureau. Whether or not people see themselves as middle class, there’s no agreed-upon definition of the term. In part, it’s a state of mind. Incomes or lifestyles that feel middle class in Kansas can feel far different in Connecticut. People with substantial incomes often identify as middle class if they live in urban centers with costly food, housing and transportation. Former U.S. Treasury Secretary Larry Summers has urged global leaders to form a global growth strategy to combat economic stagnation and has called upon the U.S. government to ramp up investment expenditure. Writing in the the Financial Times on Monday, Summers took the opportunity to openly address central bankers and finance ministers who are gathering in Washington this week for the biannual International Monetary Fund meetings. “In the U.S. the case for substantial investment promotion is overwhelming. Increased infrastructure spending would reduce burdens on future generations, not just by spurring growth but also by expanding the economy’s capacity and reducing deferred maintenance obligations,” he said. “Government could do much at no cost to promote private investment including authorizing oil and natural gas exports, bringing clarity to the future of corporate taxes, and moving forward on trade agreements that open up foreign markets.” Since the global financial crisis of 2008, loose monetary policies from central banks across the globe have resulted in record low interest rates in the hope of stimulating borrowing and spending. This has been accompanied by asset purchases by the U.S. Federal Reserve and others. Summers believes that while this may be better than the strategies put in place during the Great Depression of the 1930s, it doesn’t necessarily have a big impact on spending decisions. There are identical risks in any stimulus. The catchall response to worries about China’s credit-bloated economy is don’t worry, the government controls the money, and with it, the ability to fix or patch-up any problems. That means talk of a Lehman-style financial crisis, a Minsky moment or a property implosion are all rather far-fetched, as Beijing simply won’t allow it. Indeed, last week it was very much business as usual as a mini-stimulus was announced to shore up flagging growth. This will see more affordable housing being built, more railways, as well as a tax cut for small businesses. At the same time, guidance from China’s central bank was unequivocally reassuring. The People’s Bank of China (PBOC) released a brief statement after its quarterly policy meeting saying economic conditions are in a “reasonable range,” though the economy faced complicated situations. It also reaffirmed a commitment to keep the exchange rate at an “appropriate level,” while adding that domestic price levels are basically steady. This sanguine outlook is a contrast to red flags at various agencies, from the IMF to the Bank of International settlements, about China’s dangerous build-up of credit, now estimated at over 200% of GDP. Such warnings are nothing new perhaps, but the difference this time is that the PBOC no longer controls all the money. It has become increasingly clear just how much foreign capital China has borrowed, despite its closed capital account. And this foreign capital is getting edgy as the yuan weakens and markets brace for further Fed tapering. According to one estimate by the Bank of International Settlements (BIS), foreign credit to China has more than tripled over four years, rising from $270 billion to $880 billion in March 2013. Much of that lending has come through Hong Kong and Singapore. Brokerage Jefferies estimates that Hong Kong’s financial system has become linked to an “invisible carry trade” with a parabolic surge in lending to mainland China. Since 2009 Hong Kong banks have lent almost $400 billion. Wonder if there’s a Red Queen in ancient Chinese culture. Would be fitting. China’s development has been driven by investment, which represents around 50% of Gross Domestic Product. About half of this investment is in property. Infrastructure investment is also high, far greater annually than the U.S. and Europe, but also than other emerging markets — double that of India and around four times that of Latin America. China’s total investment levels are also 10%-15% of GDP higher than comparable countries, such as Japan and South Korea, at the equivalent stage of development. China’s central government wants to enhance domestic demand and consumption, but the task is made even more difficult by the influence that state-owned enterprises command over the national economy. China has about 150,000 SOEs, which control around 50% of industrial assets and employ around 20% of the nation’s workforce. These SOEs receive plenty of government support — except they aren’t as profitable as their private sector peers. SOEs have become a drag on China’s economic potential and are need reform. How, and how much, that will happen is questionable. That said, China’s consumption has not been static, growing strongly at around 8% annually over the past decade. However, the growth in consumer spending has been slower than that of the overall economy and the increase in gross fixed investment, at an average annual growth of over 13% annually, has dropped private consumption to about 35% of GDP. If China’s economy grows at 8% annually , consumption needs to grow by around 11% just to increase the share of consumption one percentage point, 36% of GDP, in a year. Assuming a growth rate of 8% and consumption increases of 11%, it would take around five years to increase consumption to 40% of GDP. If growth slows, then the difficulty increases. As China frets about meeting its target of about 7.5% growth in 2014, it’s time for more stimulus. The State Council, China’s cabinet, announced plans this week to further expand railways across the country, renovate dilapidated urban housing, and provide new tax breaks for small businesses. Many analysts are expecting a return to looser credit policies this year as well. But what China considers unacceptable levels of gross domestic product growth would be the envy of most other countries. So why do China’s leaders demand such rapid rates of economic expansion? A clue to that is found in Premier Li Keqiang’s recent work report, China’s version of a state of the union speech. Creating enough jobs – mentioned 11 times in the document released on March 5 – is what drives Chinese officials’ obsession with fast-rising GDP. China needs high levels of growth – at least 7%, says Li – to ensure enough jobs for 7.2 million college grads and 10 million people flooding cities from the countryside every year. China’s leaders have set a target of producing at least 10 million jobs this year, and a record-high 13.1 million urban jobs were added last year. “Employment is the basis of people’s well-being,” Li said in the work report. “We will steadfastly implement the strategy of giving top priority to employment.” The trouble is, new stimulus mainly means more investment-driven expansion, which already accounts for about half of the economy. That’s problematic given industrial overcapacity and soaring debt levels held by local governments and companies. Chanos has been “on” China for a long time. He knows a thing or two. The country still houses massive stretches of unoccupied residential complexes, with three to six years of unsold supply left over outside of Beijing and Shanghai, Chanos said. Chinese growth figures don’t account for sales, so the country’s enviable growth rate includes construction projects left empty, Chanos said. China fueled its construction boom largely on credit. “Anybody who thinks that can’t collapse because of too much lending has not looked at economic history,” Chanos said. For the first time since 2007, investors are willing to lend five-year money to Spain at a lower interest rate than they charge the U.S. government. Yes, that’s not a typo. Spain, where more than a quarter of the nation is unemployed is paying less than the world’s biggest economy, which also happens to own the global reserve currency of choice and the deepest and most liquid bond market anywhere. Today, Spain’s five-year bond yield dropped to as low as 1.71%, compared with about 1.72% for the comparable Treasury yield. Provided we believe that “in price, is knowledge” — an increasingly bankrupt tenet in these days of central bank intervention and manipulation – what does this tell us? For one thing, it reinforces the view that credit ratings on sovereign borrowers are pretty meaningless. Uncle Sam still enjoys the top Aaa grade from Moody’s and AA+ from Standard & Poor’s, while Spain languishes among the alphabet spaghetti of Baa2 (Moody’s) and BBB- (S&P). So, Spain would have to be upgraded by no fewer than eight levels at Moody’s to get the same credit score as the U.S. Just as telling, Spain would only have to be downgraded by two levels to be classified as junk. The main implication, though, is that investors are increasingly convinced that Mario Draghi and the European Central Bank are about to lace up their bond-buying boots, just as Janet Yellen and the Federal Reserve are scaling back on their yield-suppressing debt purchases. The bond market is telling us that it thinks quantitative easing is coming to the euro region. During the proceedings, Wriston led the charge on behalf of his brethren in the crusade. Tall, slim, elegantly dressed, and the most articulate of the three, he dramatically called on Congress to “throw off some of the shackles on banking which inhibit competition in the financial markets.” The global financial landscape was evolving. Ever since World War II, US bankers hadn’t worried too much about their supremacy being challenged by other international banks, which were still playing catch-up in terms of deposits, loans, and global customers. But by now the international banks had moved beyond postwar reconstructive pain and gained significant ground by trading with Cold War enemies of the United States. They were, in short, cutting into the global market that the US bankers had dominated by extending themselves into areas in which the US bankers were absent for US policy reasons. There was no such thing as “enough” of a market share in this game. As a result, US bankers had to take a longer, harder look at the “shackles” hampering their growth. To remain globally competitive, among other things, bankers sought to shatter post-Depression legislative barriers like Glass-Steagall. And the RIght Sector stormed offices in Kiev at the same time. Hundreds of pro-Kremlin demonstrators seized official buildings in Ukraine’s eastern regions, where separatist unrest turned deadly last month, urging referendums on joining Russia. Buildings in the cities of Donetsk, Kharkiv and Luhansk were occupied yesterday by protesters with Russian flags who also called for a boycott of May 25 presidential elections. Amid the unrest, acting President Oleksandr Turchynov canceled a trip to Lithuania and convened a special meeting of law enforcement officials, according to the website of the Ukrainian parliament. Ukraine’s government, which came to power after Kremlin-backed President Viktor Yanukovych fled the country last month, has accused Russia of stoking tensions in the country’s eastern regions following the annexation of Crimea. The U.S. and NATO have urged Russian President Vladimir Putin to pull back thousands of troops massed on his neighbor’s eastern border in the worst standoff since the Cold War. I hinted at this a few times. Very informative article, far too long to post here. Highly recommended reading. “Our terminals are in Europe. We will certainly look very carefully into that to see if this scheme is legal. I think this issue requires careful study and consideration. For example, I think that the European companies that plan to supply gas to Ukraine through such reverse flow should think twice whether such transactions are legal,” said Miller. The issue of the reverse gas deliveries was raised by Ukraine’s coup-appointed PM Arseniy Yatsenyuk who said on Wednesday that Ukraine is looking forward to a political decision by the EU to start reverse gas supplies from Slovakia. Yatsenyuk also added on Saturday that Ukraine may get up to 20 billion cubic meters of reverse gas from Slovakia, Poland and Hungary. Our world wouldn’t run anymore without producing insane amounts of waste. It’s written into the model. Supermarkets have been forced to defend their efforts to tackle the UK’s food waste crisis, after being accused by MPs of contributing to the “morally repugnant” mountain of produce thrown away each year by shoppers. A report published today by the House of Lords EU Committee, Counting the Cost of Food Waste, urged supermarkets to end “Buy One, Get One Free” promotions to help cut the 15 million of tonnes of food wasted in the UK each year, at a cost of £5bn. But the British Retail Consortium, the industry body that represents the supermarket chains, said the Lords committee should focus on “evidence-based policy, rather than being distracted by perception”. A spokesman said: “The report is useful in highlighting the need for everyone, including retailers, government and consumers, to make cutting food waste a priority. However, it appears to have not appreciated what is already happening. The media has been overwhelmed by talk of Crimea joining Russia, but all are ignoring the fact that the ‘Five Eyes’ intelligence alliance, principally the US, has annexed the whole world through their spying, said WikiLeaks founder Julian Assange. Speaking at the WHD.global conference on Wednesday, Assange – who has been living under asylum in Ecuador’s embassy in London since 2012 – pointed out that there is a need for independent internet infrastructure for countries to maintain sovereignty to resist US control over the majority of communications. The annual conference is dedicated to global surveillance and privacy matters. Assange noted that the revelations leaked by Edward Snowden on NSA and GCHQ spying have caused a new wave of resistance against US control, shifting the geopolitical forces in Europe. “These revelations about the United States and GCHQ annexing our new world of the internet has produced market forces to do something about it. But they’re also playing into, within Europe, a very interesting geopolitical phenomenon, which is Germany’s new leadership of Europe, and it demonstrating its new leadership of Europe.” “One of the ways to demonstrate its leadership is to demonstrate how someone else does not control you. Here we have an example of Angela Merkel and German society as a whole striving slowly to demonstrate some kind of independence in relation to the United States,” he said. BP is expected to come under pressure at its annual meeting this week to explain how its decision to take a 20% stake in Russia’s biggest oil company, Rosneft, will be affected by the country’s standoff with the west over Crimea. BP’s annual meeting, held at the ExCel centre in London’s docklands on Thursday, could see questions from shareholders about Rosneft, continuing legal threats in the US and executive pay and environmental issues. The British oil group has already been drawn into the row over Russia’s annexation of Crimea with calls for Rosneft’s delisting from the London Stock Exchange. There is a risk that the Russian president, Vladimir Putin, could expropriate assets from western companies, including BP, said independent analyst Louise Cooper. BP’s Rosneft stake accounts for a third of its production volume and gives it a stake in Arctic exploration. In addition, BP still operates under the cloud of the Deepwater Horizon disaster. It has already paid out billions in compensation to victims but could face further penalties of up to $20bn (£12bn), on top of the existing $40bn bill, if it is found guilty of gross negligence by the US department of justice. HSBC oil analysts Gordon Gray and Peter Hitchens wrote of the 2010 disaster in the Gulf of Mexico : “In the case of gross negligence 1) BP’s balance sheet looks strong enough to weather it in our estimates, and 2) we would expect a multi-year appeal process to mean the near-term financial impact would be limited.” They also thought BP’s strategy presentation in early March “did a good job of shifting the strategic emphasis from the post-Macondo [Gulf of Mexico] recovery to its longer-term growth potential”. BP can point to a recent deal with US environmental protection authorities that will enable the oil company to bid for drilling rights in the Gulf of Mexico. Big Oil’s death bad, or debt rattle if you will. It won’t go down without a bitter fight though. As advances in horizontal drilling and hydraulic fracturing have boosted U.S. crude oil and natural gas production to multidecade highs, midstream companies have struggled to keep up with the surge in output. In remote resources plays like North Dakota’s Bakken shale, where pipeline capacity is limited, many companies are shipping the majority of their production by rail. Midstream companies recognize these challenges and are investing heavily in the necessary infrastructure to transport, store, and process the oil, gas, and natural gas liquids being pumped out of U.S. shale plays. But to keep up with the expected growth in domestic hydrocarbon production, they will have to spend a whole lot more over the next several years. Let’s take a closer look at exactly how much, as well as one stock to play the trend. Energy companies will need to invest a whopping $641 billion on U.S. and Canadian midstream oil, gas, and natural gas liquids infrastructure over the next two decades, according to a recent study by consultancy ICF International on behalf of the Interstate Natural Gas Association of America. That equates to annual spending of roughly $29.1 billion through 2035, almost triple the $10 billion companies have shelled out each year over the past decade. In addition to heavy spending on gas infrastructure, the study estimates that some $12.4 billion per year will have to be directed toward infrastructure designed to handle crude oil, including pipelines, gathering lines, and storage tanks. Lastly, another $2.5 billion in annual spending will be required for infrastructure associated with natural gas liquids such as ethane, butane, and propane, including NGL pipelines, fractionation, and export facilities. A gigantic resort proposed for far north Queensland does not need federal environmental assessment, its backers have argued, even though it includes two casinos, eight accommodation towers, a golf course and a 33-hectare lake filled via a 2.2km pipeline from the Great Barrier Reef. The $8 billion Aquis project, slated for Yorkeys Knob, north of Cairns, is described as “Australia’s only genuine, world-class, integrated resort”. The resort, which would cover 340 hectares, is backed by the Hong Kong investor Tony Fung, who last year bought the Reef Casino Trust, which operates the Cairns casino. An initial advice statement from July last year describes the casino as the “man-made wonder of the world” that north Queensland is missing. The development would include accommodation for up to 12,000 guests, an 18-hole golf course, tennis courts and the artificial lake. The resort would be built on the Barron river floodplains, which drains into the Great Barrier Reef lagoon, on land used mostly as sugar cane plantations. The proposal has divided the small community of Yorkeys Knob. In a submission to the federal Department of the Environment last week, Aquis maintained it did not require a commonwealth environmental assessment process, as any impacts on the surrounding environment – including the reef – were not significant enough to warrant it. Should the proposal be considered for a “controlled action” under environmental legislation, a report appended to the submission is good enough. “A draft EIS [environmental impact statement] has been completed but not submitted to the co-ordinator-general, pending finalisation of a related issuing of a casino licence that is critical to the project viability,” the company said. “We’re paying more attention to house prices and credit than the currency to see if the RBA changes its mind on macro-prudential tools [which limit lending growth] to gauge if housing strength could trigger a rate rise this year.” In March RBA governor Glenn Stevens warned “we need to be alert to the possibility that the past year of strong rises in dwelling prices leads people to assume that this is the norm”. “Were such an assumption to lead to increasing speculative activity, accompanied by a renewed increase in household leverage with all the associated risks to the housing market … that would be unwelcome,” Mr Stevens said. Australian house prices leapt almost 11% over the 12 months to 31 March to record levels in absolute terms, with capital gains of 15 % experienced in the nation’s largest city, Sydney. 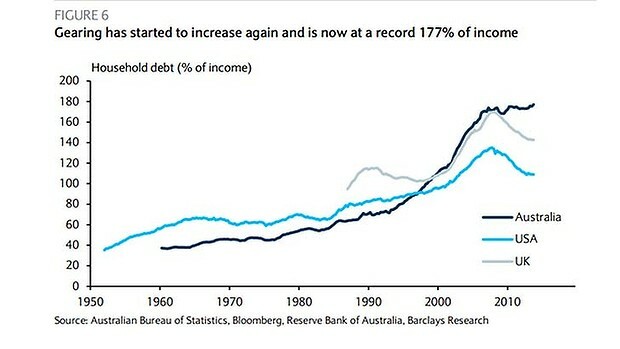 Using ABS data on total Australian household liabilities and incomes, including small business debts that are excluded from similar RBA metrics, Barclays found that the ratio of household debt to disposable incomes has hit a record of 177%. “This is up from a recent low of 173% and exceeds the previous high of 175% reached in 2010,” Mr Davies noted. In striking contrast to consumers in the US and UK, Australian families have boosted debt relative to incomes since the 2008 crisis. 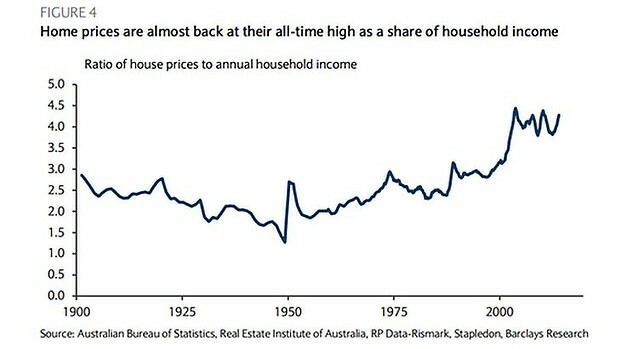 The RBA put the household debt to income ratio at 149% in December, just a touch off its 153% peak in 2006. Wind power in the U.S. is on a respirator. The $14 billion industry, the world’s second-largest buyer of wind turbines, is reeling from a double blow — cheap natural gas unleashed by the hydraulic fracturing revolution and the death last year of federal subsidies that made wind the most competitive of all renewable energy sources in the U.S. Without restoration of subsidies, worth $23 per megawatt hour to turbine owners, the industry may not recover, and the U.S. may lose ground in its race to reduce dependence on the fossil fuels driving global warming, say wind-power advocates. They place the subsidy argument in the context of fairness, pointing out that wind’s chief fossil-fuel rival, the gas industry, is aided by the ability to form master limited partnerships that allow pipeline operators to avoid paying income tax. This helps drive down the cost of natural gas. “If gas prices weren’t so cheap, then wind might be able to compete on its own,” said South Dakota’s Republican Governor Dennis Daugaard. Consider that gas averaged $8.90 a million British thermal units in 2008 and plunged to $3.73 last year, making the fuel a cheaper source of electricity for utilities. Congress allowed the wind Production Tax Credit to expire last year, and wind farm construction plunged 92%. A smart species, you said? Towering flames atop oil wells break the inky darkness in the badlands on North Dakota’s Fort Berthold Indian Reservation. The flares of natural gas set grass fires on the prairie where Theodora Bird Bear’s ancestors hunted buffalo and create a driving hazard on rural roads. “At nighttime, clouds of gravel dust from semis are lit up with flaring lights,” said Bird Bear, 62, who can see flames shooting from a well behind land where she grows red beans, corn and squash. “It’s a hellish scene.” Twice as much natural gas is wasted through flaring than in 2012 amid an energy boom that’s propelled North Dakota’s torrid economic growth. The state’s employment expansion has been the fastest in the U.S. for four years. In the rush to exploit the Bakken shale formation, which holds the nation’s second-largest oil supply, companies from Statoil to Whiting Petroleum are stepping in to try to capture more of what’s lost. Natural gas burned in flaring is a byproduct of crude oil. Without enough pipelines to transport the gas, or the refinery capacity to process it, about a third of what’s released each day, worth $1.4 million, goes up in smoke. Tribal members say as much as 70% of gas from wells on the reservation is flared. “We’re confessing that we are flaring a tremendous amount of gas right now,” Governor Jack Dalrymple, a Republican, said at a Bloomberg Link Conference, Energy 2020, in Washington on Feb. 24. “Everybody feels it’s a huge waste, to say nothing of the environmental impact.” Drillers flared 340 million cubic feet, or 30%, of the 1 billion cubic feet of natural gas produced per day in January, about twice as much as the 184 million cubic feet burned per day two years ago, said Marcus Stewart, an analyst at Denver-based Bentek Energy. The lost revenue adds up to $1.4 million each day, he added. Energy executives say economic realities force them to start producing oil from wells before infrastructure is in place to haul away less-valuable natural gas. Bakken oil fetched $98.14 on April 4, while natural gas for May delivery fell to $4.439 per million British thermal units on the New York Mercantile Exchange the same day.